This week in our series, we talk about the election of 1828. It was bitter and full of angry words and accusations. The old Republican Party of Thomas Jefferson had split into two opposing groups. President John Quincy Adams led one of the groups. It called itself the National Republican Party. Andrew Jackson, a military hero and politician, led the other group. It called itself the Democratic Party. Each party had its own newspapers. In Washington, the Daily National Journal supported President Adams. The United States Telegraph supported General Jackson. The Telegraph published accusations by Democrats in Congress against the administration. The Journal, in turn, published a pamphlet that said Jackson had fought a man, chased him away like a dog and then stolen his wife. Jackson denied these claims. Historians still do not know how much of this story is true. But the story had a great effect on Jackson for the rest of his life. Jackson met the young woman, Rachel, at her mother's home near Nashville, Tennessee. Rachel and her husband, Lewis Robards, were living there at the time. They were having marriage problems. Robards argued with his wife about Jackson. He said she and Jackson seemed too close. Robards reportedly wanted to fight Jackson with his fists. Jackson said he would face Robards not in a fistfight but in a gunfight, if Robards wished to fight like a gentleman. Robards rejected the invitation to a duel, and nothing more happened between the two men. Robards and his wife settled their differences. But a short time later, they had another dispute, and Rachel left. Court records said she left with a man — Andrew Jackson. Rachel's family said she told Robards she wanted a divorce. They said he threatened her, telling her he would carry her away by force. So Rachel’s family said she decided to flee. She decided to go with some traders to Natchez, in the dangerous Mississippi territory. By now, Rachel meant a great deal to Andrew Jackson. He had fallen in love with her. When the traders asked him to go with them to Natchez to protect them, he agreed. The group left for the territory early in 1791. For his part, Lewis Robards began preparations for a divorce. He allowed Rachel’s family to believe that he and Rachel were no longer married. But, in fact, he did not complete the necessary legal action to make the divorce final. Jackson returned from Natchez after several months. His opponents later claimed that he had married Rachel while in Natchez. They said she was still another man’s wife at the time. Opponents said the couple’s relationship was both immoral and illegal. They said Jackson was an adulterer for having a relationship with a married woman. And they said Rachel was a bigamist for having two husbands. But Jackson said he believed Rachel and her first husband, Lewis Robards, were divorced. He said he returned to Nashville to ask Rachel’s mother for permission to marry her daughter and that she agreed. Andrew and Rachel Jackson remained in Tennessee. The next two years were busy for Jackson. As a young lawyer, he worked hard and traveled far. Then, in December 1793, Jackson said he discovered court papers showing that Lewis Robards had only recently divorced Rachel. Jackson said he was shocked. As soon as possible, he and Rachel were married again — legally this time. Almost 10 years passed. Jackson became a judge and got involved in Tennessee politics. But the circumstances of his marriage remained an issue that led to arguments. For instance, a man once accused Jackson of cheating on a horse racing bet. Then the man called his wife a bigamist. Jackson killed the man in a duel. Later, in the 1828 presidential election, Jackson’s opponents made Rachel’s honor a campaign issue. Jackson could not duel everyone who questioned his wife’s honor. So he asked a special committee of citizens to investigate his marriage and make a public report. Many people on the committee were his friends or supporters. The committee found that the Jacksons were not at fault for getting married before Rachel and her first husband were legally divorced. The pro-Jackson newspaper in Washington published the committee's report. Pro-Jackson papers also began to print vicious stories about President Adams and his wife. Anti-Jackson newspapers did not publish the committee’s report. They continued to denounce the Jacksons’ marriage. Historian Daniel Feller at the University of Tennessee is an expert on Andrew Jackson. He says the charges about Jackson’s marriage made a good story for people to talk about. But he says other accusations were more serious. These were about Jackson’s career. All during the bitter election campaign, neither Jackson nor his opponent, President Adams, said anything about one very important issue: slavery. Adams did not want to lose what little support he had in the South and West by denouncing slavery. Jackson did not want to lose the support of some Republicans in the North by openly defending it. Adams's silence did not mean that he approved of slavery. Southerners were sure that he opposed it. And Jackson did not have to tell the South what he thought about slavery. He was a slave owner, and he had bought and sold slaves all his life. Many of the president's supporters felt that wealthy, property-owning citizens should control the government. Jackson and the Democrats represented the interests of the common people. They did not feel that the rich had more right to govern than the poor. The presidential election of 1828 was held on different days in the different states between October 31 and November 5. Voters in the northern states supported John Quincy Adams. Andrew Jackson won the South. Historian Daniel Feller says Southerners did not seem bothered by opponents’ fears that Jackson was mentally unstable and believed he should have unlimited power. Even President Adams recognized that Jackson was extremely well-liked. When the electoral votes were counted, Andrew Jackson received 178. President Adams received only 83. 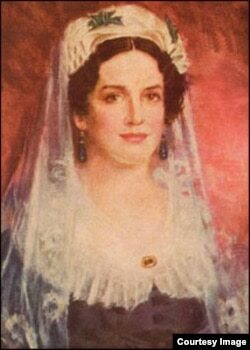 Rachel Jackson was proud of her husband. But she was not happy about the life she would have to lead as first lady. And her health seemed to be suffering. “For Mr. Jackson's sake," she said, "I am glad. For my own part, I never wished it." Nevertheless, the couple prepared to move to Washington. There was little time for Rachel to rest. Then, just a few days before the Jacksons were to move, two doctors were called to the Jackson home. They found Rachel in great pain. She seemed to be having a heart attack. After a day or so, she appeared to be better. She was able to sit up and talk with friends. But her mind was still troubled about the years ahead in Washington. "I had rather be a doorkeeper in the house of God," she said, "than to dwell in that palace in Washington." In December of 1828, a few nights before Christmas, Rachel was sitting in a chair. Her husband had already gone to sleep. Suddenly, Rachel cried out and fell to the floor. The servants screamed. Jackson ran to the room, picked Rachel up and carried her to the bed. But he could see that life had already left her. Witnesses said Jackson continued to sit next to her, holding his head in his hands. Rachel was buried two days later. Ten thousand people went to the funeral. The Reverend William Hume spoke of Rachel Jackson's life. He talked of her kindness and humility. And he told how she had been upset about the personal accusations against her during the election campaign. 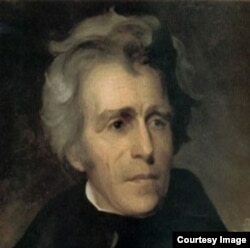 At that time, Andrew Jackson was 61 years old. He was a tall, thin man. His long face was wrinkled. Most portraits of him show a great mass of messy hair pushed back from his high forehead. Jackson's health had never really been good. He carried in his body two bullets from duels fought years before. But he was a tough man with a spirit strong enough to keep moving, even when he was grieving. He left for Washington, DC in January 1829. A huge crowd was gathering there to greet him. They would create one of the wildest inaugural celebrations in American history. And that will be our story next week. I’m Steve Ember, inviting you to join next time for The Making of a Nation — American history from VOA Learning English.